From heartfelt sentiments on a homemade card and grandparents' lunch in the school cafeteria to a handcrafted memory book and a special family dinner at a favorite restaurant, ideas for Grandparents Day are as varied as grandparents themselves. 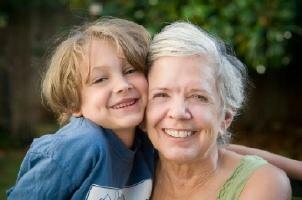 Finding the right idea for Grandparents Day is only a few clicks away. Each year on the first Sunday after Labor Day in September, grandparents across the country are honored by their grandchildren on National Grandparents Day. Having a special day to honor and celebrate grandparents was only a dream for a homemaker from West Virginia, Marian McQuade. Leading an active campaign for Grandparents Day, Marion McQuade's dream became a reality, first in 1973 when West Virginia recognized Grandparents Day and then in 1978 when President Jimmy Carter signed a proclamation creating National Grandparents Day. If you love making crafts, the Internet provides many websites loaded with craft ideas and directions. Many of these crafts make wonderful gifts and grandmothers and grandfathers love receiving handmade gifts from their grandchildren. Some crafts are simple to make, which is perfect for preschoolers and young children. Others are more difficult made for teen and adult crafters. Grandparents truly cherish gifts from their grandchildren. The following websites offer unique gift ideas for grandparents that shows your grandmother and grandfather how special they are to you. A Retro Candy Gift Box or Decade Box Gift Basket full of nostalgic candies from the1940s, 1950, 1960s or 1970s. Bears in Chairs offers fun gift items for grandparents including a family of bears sitting on a couch that is personalized with Grandma, Grandpa and the names of the grandchildren in front of each little bear. Bears in Chairs also offers many other adorable bear gift items. Cook a favorite meal for your grandparents and surprise them with dinner or plan a family get together. Make enough food to prepare a dinner that they can refrigerate or freeze to enjoy at another time. Write your grandparents a letter letting them know how much they mean to you. Spend a family game night together with grandparents, parents and grandchildren playing games that everyone can enjoy. Play board games, cards or games on the Wi. Take a family day trip to a place everyone enjoys such as a movie, a park or a zoo. Make a scrapbook with your grandparents. Enjoy a family dinner at a restaurant that everyone will enjoy. Whether you are a grown up grandchild or the parent of young grandchildren, one of the best gift ideas for Grandparents Day is the gift of your time.